Every day more Fender Deluxe 5E3 circuits come to life for the first time than perhaps any other design. A simple internet search of "Fender Tweed Deluxe kit" turns up enough links to force even Fender itself to consider entering the hot DIY market. 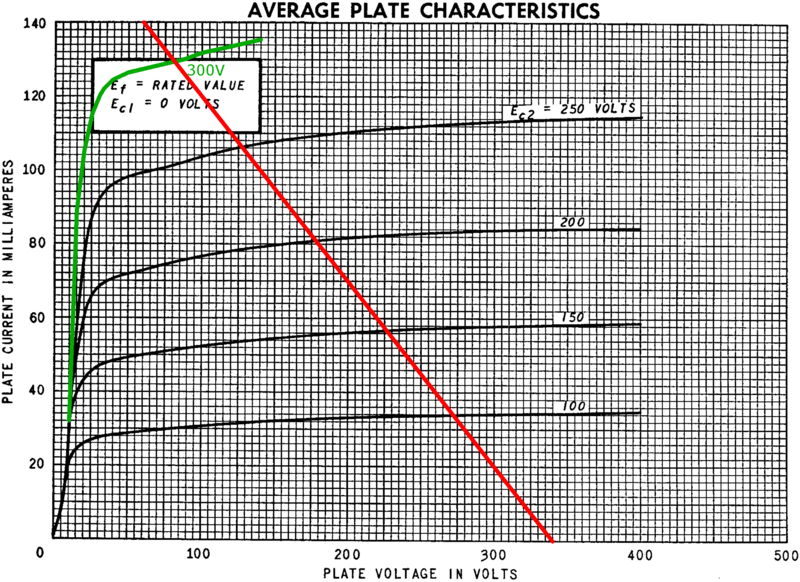 The plate and screen supply voltages shown here are calculated values, not measured values, based on RC ripple filter resistor values and data sheets for the 6V6 and the 5Y3 rectifier. The first stage has two channels that share a fully-bypassed 820Ω cathode resistor. 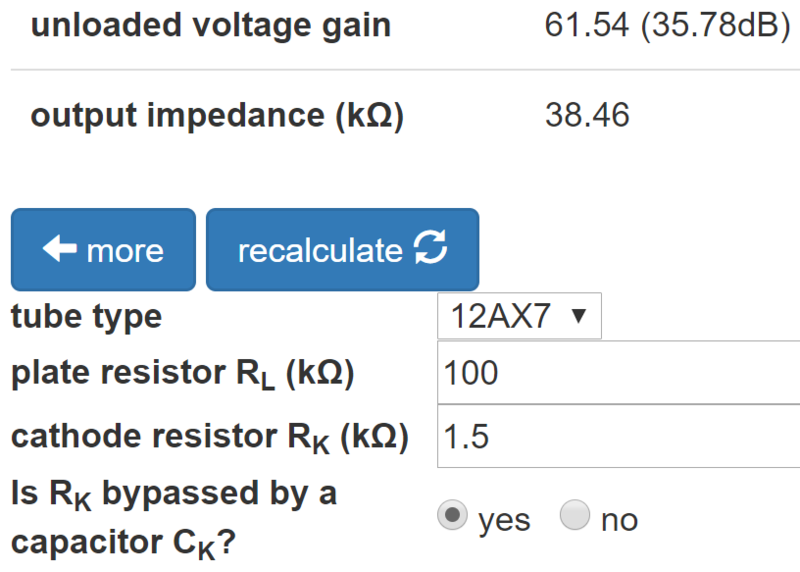 The equivalent resistor value for one triode is 1.64kΩ. 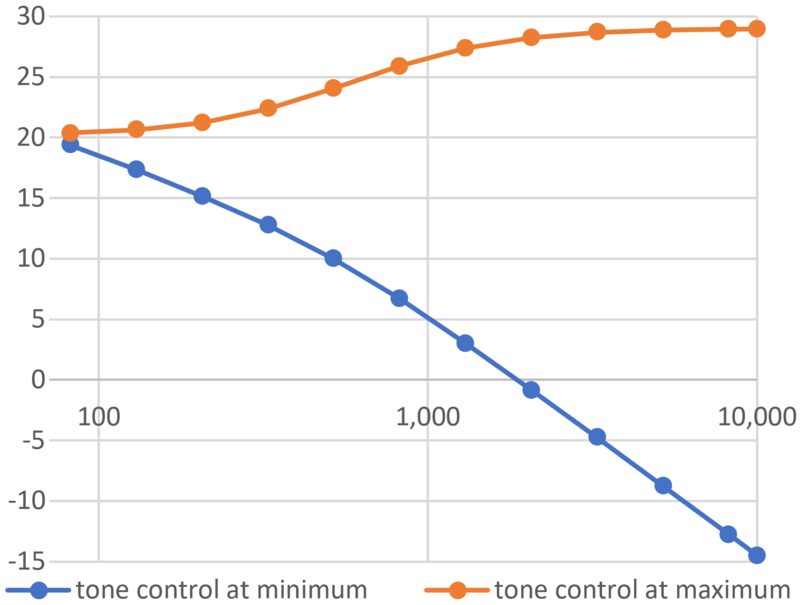 The actual AC load varies substantially with the settings of the volume and tone controls. Moreover, frequency has a big impact. At 82 Hz, the 0.005μF tone control capacitor has a relatively large reactance of 379kΩ. For the 500pF capacitor it is even greater: 3.79MΩ. At 10kHz, the reactances decrease to only 318Ω and 3.18kΩ, which are quite low compared to the resistances of the potentiometers. The AC load therefore varies greatly with knob position and frequency. 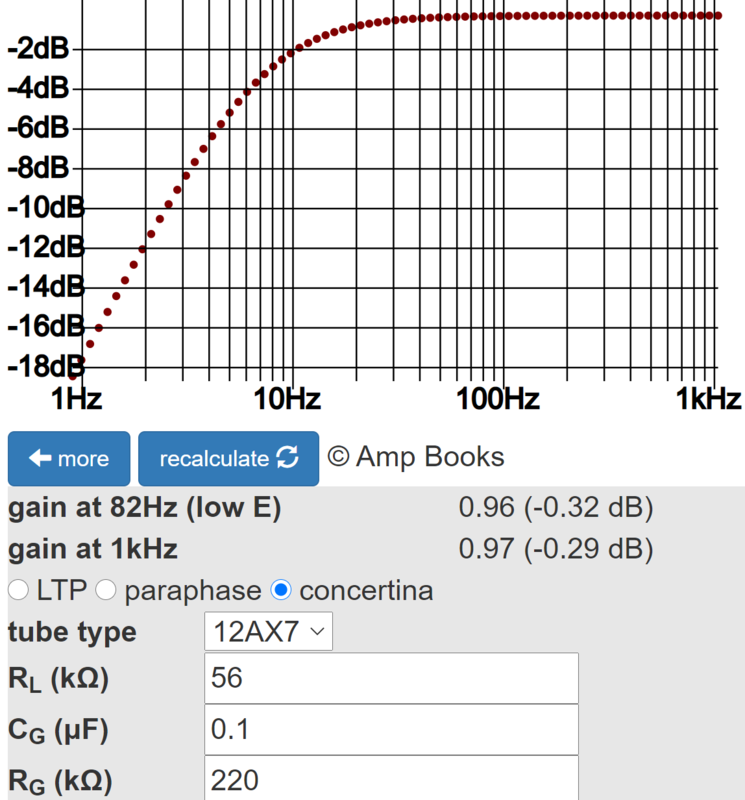 Below is the frequency response in dB versus frequency in hertz with the volume control set to 50-percent rotation (10-percent resistance). The volume control for the other channel is set to minimum. 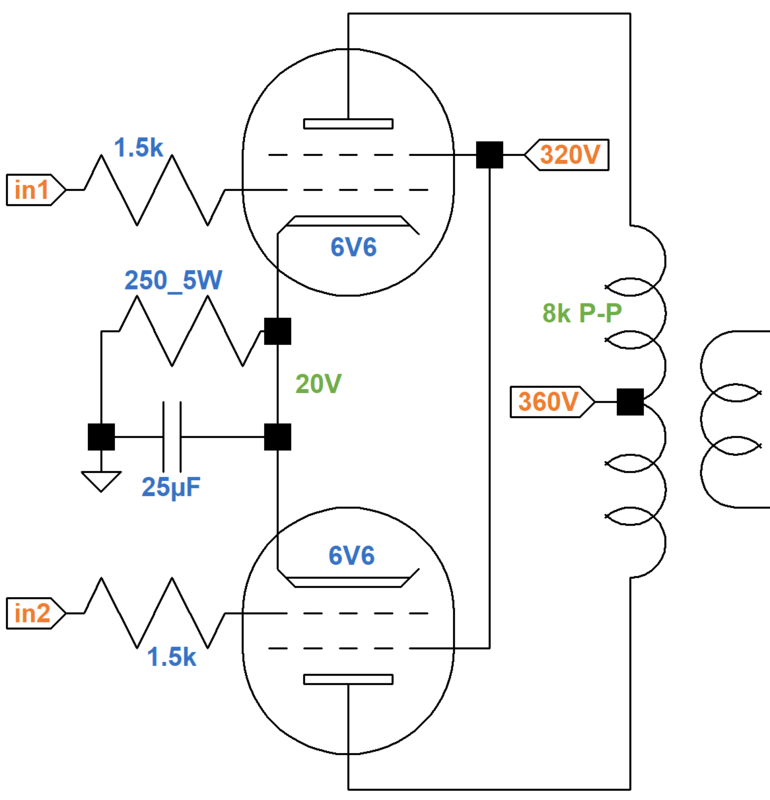 The second stage is a classic voltage amplifier with a fully bypassed cathode resistor. The resistor RG represents the input impedance of the next stage. 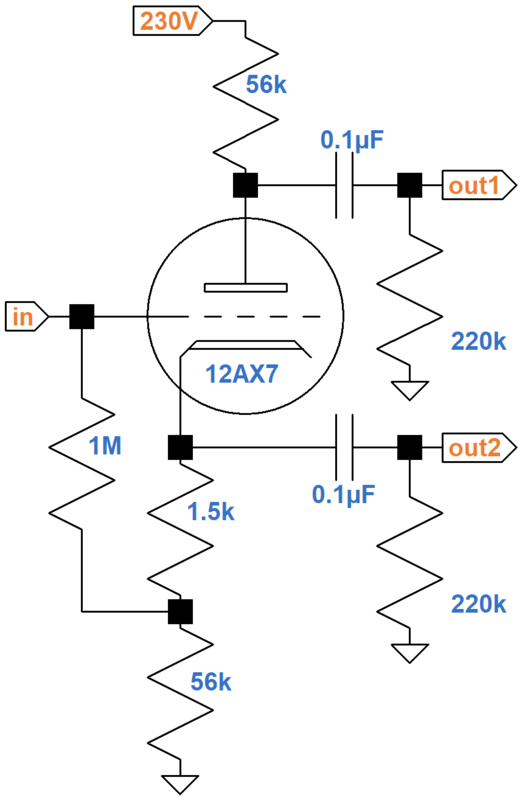 According to the 12AX7 calculator, the DC grid bias is about -1.2V. (The AC load is again set to an arbitrarily low value of 123kΩ to better mark the DC operating point.) The input impedance RG is greater than 1MΩ, representing a very light load, so the actual AC load line is rotated only slightly clockwise from the DC load line. 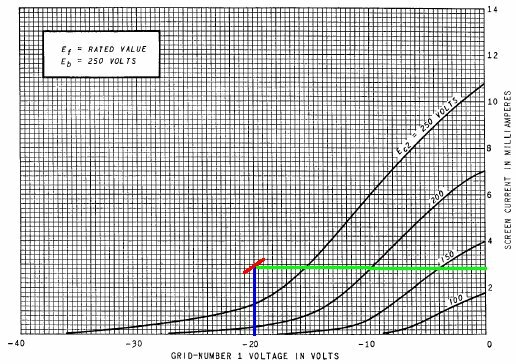 The grid voltage can swing positive by 1.2V from the DC operating point, making input headroom equal to 1.2V peak (-1.4dBV). 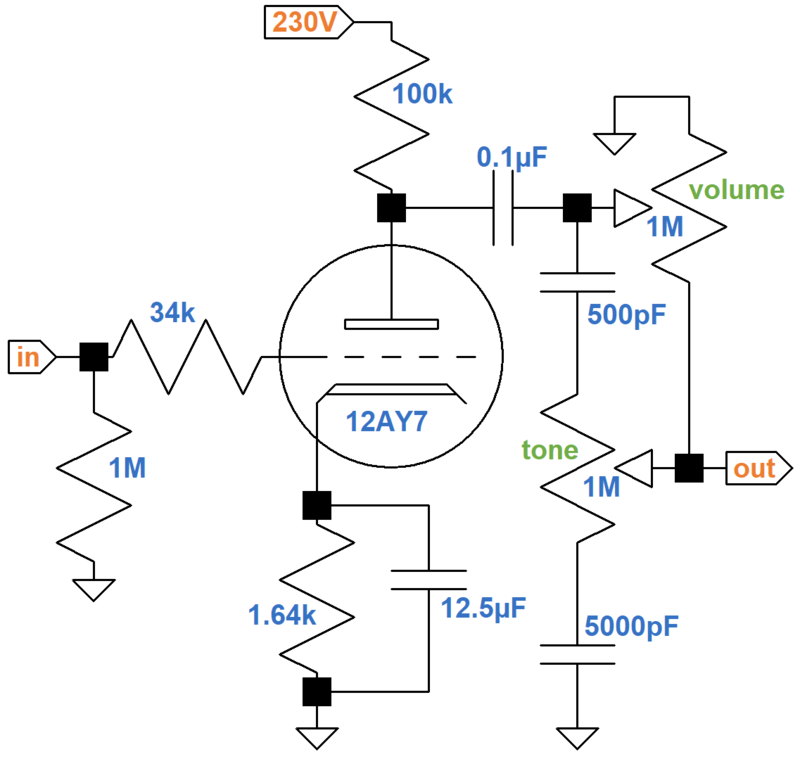 If we assume a first stage gain of 20dB, the guitar signal at the input jack needed to overdrive the second stage is is -21.4dBV (120mV peak), which can be achieved by hot pickeups. According to the Preamp Gain and Output Impedance calculator, the unloaded gain and output impedance are 36dB and 38kΩ, respectively. Because of the light AC load of the next stage, the loaded gain is approximately the same as the unloaded gain. The 5E3 uses a concertina phase splitter (also called a cathodyne or split-load inverter). 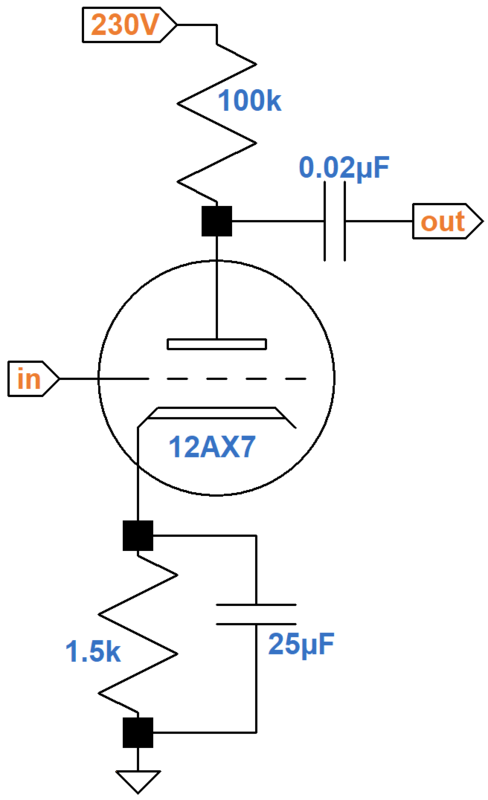 The DC grid bias is -1.2V. 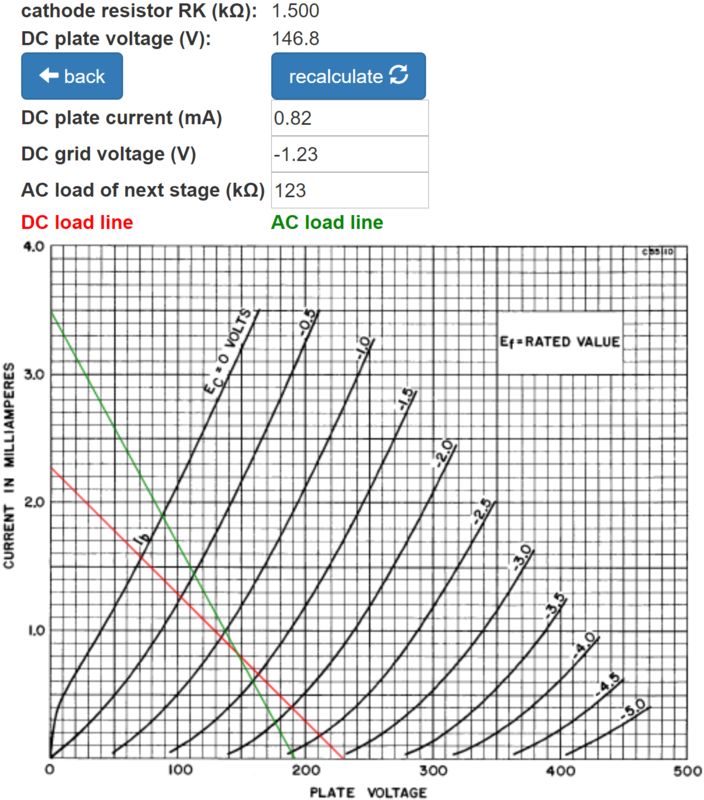 According to the AC load line, maximum peak-to-peak plate voltage swing is from 76V to 198V. The total swing is split between the two outputs, but it far exceeds the 20V peak input signal needed to drive the power amp to full power. The power amp is therefore the first stage to break into overdrive, while the phase inverter runs clean. The inverter has approximately unity voltage gain. 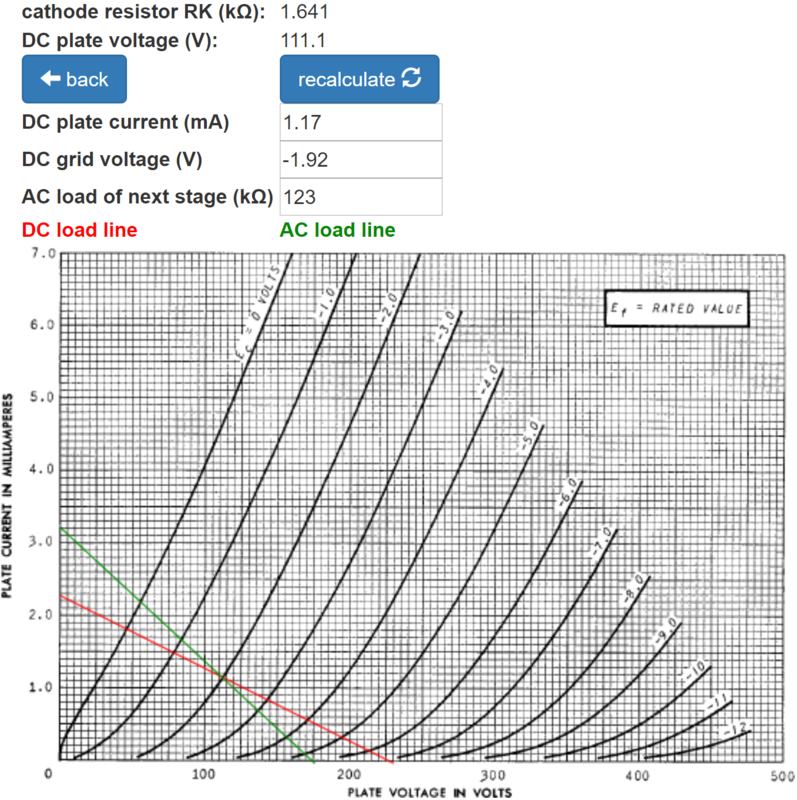 According to the Phase Inverter Bass Response calculator, the 0.1μF coupling capacitors provide a very flat response. Here is the power amp. The plate-to-cathode voltage is 340V and the screen-to-cathode voltage is 300V. The current through the 250Ω cathode resistor is 20V/250Ω = 80mA, or 40mA per tube. The transfer curves for the screen current shows about 3mA for an imagined 300V screen curve (red) and a minus 20V grid. The plate current 37mA per tube. Plate dissipation is the product of plate voltage and plate current: (340V)(37mA) = 12.6W, slightly above the maximum rating of a 6V6. This is a hotly biased amp! Here are 6V6 plate characteristic curves for a 0V grid. The green curve is an eyeball estimate for a 300V screen. The effective impedance for pure Class B is 2kΩ, one fourth the plate-to-plate primary impedance. For Class AB, the load line intersects the 300V curve a bit closer to the knee. 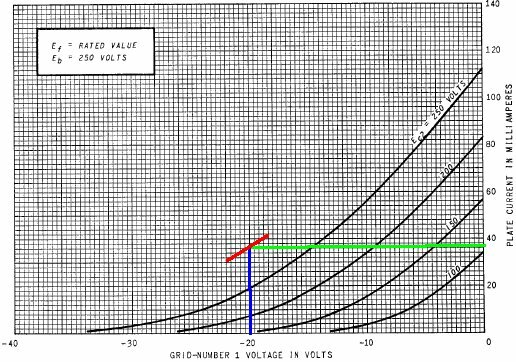 According to the load line, the plate voltage swings from 340V to 80V. The net plate current swings between 0mA and 129mA. Output power for a sinewave is (340V-80V)(129mA)/2 = 17W.